Yes, if your global pleasure is the same as mine. My global pleasure is approximately the sum of all the pleasures of all the individuals in all the species identified or not who inhabit this world, or global ecosystem, as well as what emerges from these pleasures. What pleasures any particular organisms is a bit less simple, but for me, it is this: whenever an individual engages in behaviors related to increasing odds of survival, mating, and reproducing viable offspring, Evolution reinforces such behaviors with rewards that can be interpreted as pleasure, even when that is embodied in nothing more than moving towards food, and to a lesser degree, away from predators. Evolution is about the survival of species, which means adapting to environmental changes. So conceptually, adaptive behaviors over evolutionary time have been rewarded, or reinforced positively. At the simplest level, moving towards something means being attracted by that something. Moving towards as well as acquiring that something are both rewarded with pleasurable feelings, though different systems in the brain and body will be involved in what can be condensed into wanting or liking what one has acquired. The first part of this post is about global pleasures, needs, and wants. The last part rates oysters for ecological sustainability and suggests oysters from a local Santa Barbara Company as a best choice. This post is actually Part II of a four-part series on oysters, aphrodisiacs, and global pleasure, all part of ecological sustainability in the pleasure dome (Coleridge's metaphor for all the niches in which species are driven primarily by pleasure). The previous post dealt with the dopamine hypothesis linking oyster consumption to dopamine to sexual desire. In that post I also mentioned the famous/infamous quote of the neuro-scientist Francis Crick: "Brain, you're nothing but a bunch of neurons." There is truth in Crick's quote at the local level but also, failure to consider what emerges at the whole-system level. Neurons can function relatively independently, but they also communicate, compete, override, be overwhelmed, become unresponsive, die, get frantic, collaborate, and create synaptic patterns, some of which only emerge at the greater system level, which possibly, feeds back to the local level. The brain is unarguably a complex system, composed of interconnected parts that as a whole exhibits one or more properties not obvious from the properties of the individual parts, referred to as emergent. Consciousness can be viewed as the premier emergent property of the brain. It is a property that might be considered unexpected and even inconceivable, especially just from the interactions of a bunch of neurons. So starting with these assumption, and staying at the big picture level, an ecosystem is a complex system with emergent properties. Considered here as an emergent property is ecological vibrancy, highly dependent on biodiversity. The more biodiverse is an ecosystem, the greater is the likelihood that some individuals of many species will be able to adapt to many environmental changes. The more biodiverse, the more likely it is that biodiversity will be sustained, especially under rapidly changing environmental conditions that cannot be considered evolutionary, or small changes, slowly executed. Resiliency is one property of a vibrant ecosystem, which qualitatively is at the top of any hierarchy of qualities, and this blog is all about quality. Ecosystem biodiversity equals many species, many populations, many individuals, many variations in genetic materials in those individuals, and many niches. In 2012 one generality about our global ecosystem is that biodiversity is decreasing. Species are becoming extinct. According to the first paragraph definition of global pleasure, fewer species will add up to less pleasure. But the sum of all species' pleasure does not quite equal global pleasure, which has emergent properties, such as vibrancy.A vibrant ecosystem has sustainability, resiliency, high energy levels, and is pulsating with life and action. For species not occupying the cognitive niche, most pleasures are related to physical survival needs, which may or may not include the need-desire of a hen to perch or nest, a behavior that borders on a psychological need. So from the git-go, I think of needs and wants as a dynamic process in a continuum. 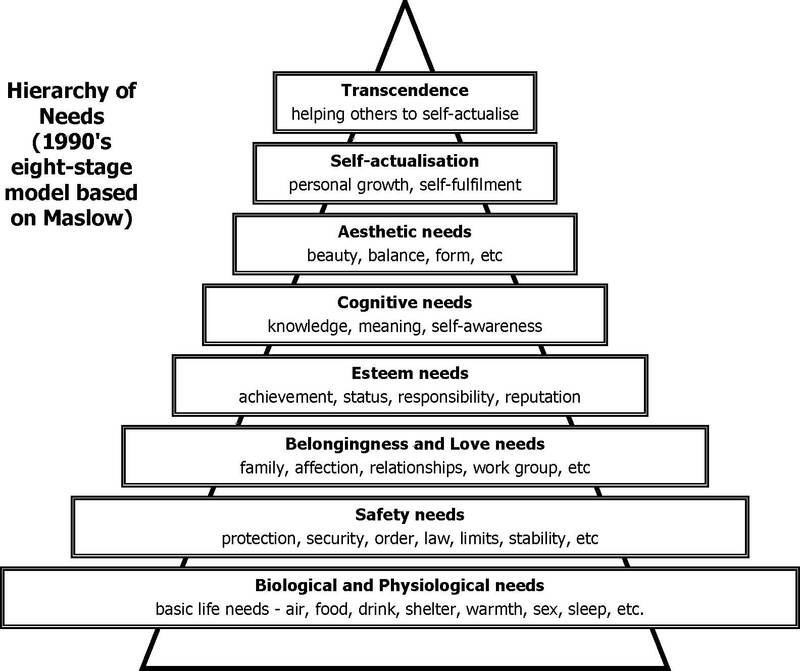 I rely as a model of needs and wants on an updated version of Abraham Maslow's Hierarchy of Needs. Note than cognitive needs occupy the fifth niche up from the basic bottom-most one of biological survival. Humans, the species classified as Homo sapiens, can occupy all levels of this hierarchy. Oysters probably occupy the first three. I include the belongingness need for oysters since the decision to settle made by oyster larvae depends to no small extent on the prior existence of conspecifics in that area. An ecosystem is more than just the sum of the elements in that system. Humans in an ecosystem can be pleasured just by understanding how oysters decide to settle in a specific place, in addition to finding oysters delicious and nutritious (see prior post for details). Understanding, which has been selected for by Evolution and hence is rewarded with good feelings, increases global pleasure. Appreciating, the baseline for experiencing beauty, is also selected for by Evolution and well rewarded. Caring for is also an adaptive behavior, hence reinforced evolutionarily. Caring for because you appreciate is doubly rewarded with feel-good feelings. Choosing oysters as a menu item could be rewarded by knowing that nutritionally, oysters are sound choices. In 2012 most oysters are farmed. Understanding the ecological sustainability of oyster production methods can increase or decrease global pleasure. There are short cuts to deciding which oyster harvesting/production method is or isn't ecological. Two of the best are the Monterey Bay Aquarium's (MBA) Seafood Watch and Blue Ocean. (using two reduces possibilities of one site biases). Choosing ecologically sound foods increases individual pleasure, hence global pleasure, which is the sum of all individual pleasures. For me, quality is the gatekeeper for subsequent comparison of which food is produced most ecologically. By that I mean that the quality has to be the best of the best. When several foods are considered of similar quality, then the deal-maker is which is produced most ecologically. MBA and Blue Ocean can both be considered world-class experts, though as mentioned in a previous post, sometimes their final evaluations differ, usually only slightly. Both experts evaluate different species independently, since species differ both in their degree of at-riskness, and some will be harvested from their native ranges while other species could be considered invasive species. A blog in late February will rate these raters, clearly, using my personal framework for rating, which will be transparent to readers. Pacific oysters, the most widely farmed oysters in the world, are delicious: briny and sweet, high points and a best rating for quality, despite the fact that they are farmed. As filter feeders, farmed fish eat pretty much what wild fish eat. They occupy similar habitats. The fact that they settle and don't swim around means that they don't suffer some of the negatives that farmed finfish do, e.g., farmed salmon don't swim huge distances, they lose their musculature, and do not eat a variety of wild foods. Blue Ocean gives Pacific Oysters a rating of 2.6 out of a possible 4, which is the minimum to qualify as a best choice of consumers of seafood. Points are lost in several categories., most in the category of risk to other species.Most Pacific Oysters farmed outside their native habitat are aquacultured in open systems, which are characterized by frequent escapes of farmed species into the wild, where they may change that ecosystem, outcompete natives, etc. Blue Ocean's ratings have a global context, meaning that although Pacific oysters farmed in Santa Barbara, where they are a native species and pose little threat to local ecosystems, the fact that they are farmed worldwide does pose a threat to other ecosystems. While Eastern oysters are also delicious, food miles are necessarily 2 to 3000 miles higher for consumers on the West Coast than Pacific oysters, and as this blog for now is contexted in the area around Santa Barbara, best choices will tend b to be local. The Monterey Bay Aquarium also gives Pacific oysters the rating of "best choice." "Farmed oysters account for 95 percent of the world's total oyster consumption. Most oyster farming operations are very well managed and produce a sustainable product. Like clams, mussels and scallops, oysters are filter-feeding shellfish that are extremely well-suited to aquaculture. Farming oysters brings little risk of pollution or escapees, and habitat effects from the farms are minimal." This blog uses local Santa Barbara Greater Ecosystem events as a home base/reference point for all posts. Everything else being equal, buying local is preferred over products produced remotely, for reasons of transport-related carbon-dioxide emissions. "The Pacific Oyster, Crassostrea gigas, is the most important cultivated oyster in the world. Originally found in Japan, the Pacific oyster was introduced to the United States in the 1930’s and has since become the predominately cultured oyster on the west coast. Santa Barbara Mariculture is growing and selling the Pacific Oyster year round. This Oyster is very tender and yields a sweet and salty flavor which is undeniably addicting." In summary for this post, for West Coast consumers, locally farmed oysters are a great choice for rewarding food anytime and especially on Valentine's Day, when expectations tend towards romance.